LetsPhysics.COM: What are Imaginary Numbers ? What are Imaginary Numbers ? Imaginary numbers are nothing,but the step taken by mathematicians to represent something out of the real world. Real,as in the word isn't actually the real world we are always referring. The mathematical usage of words confuse with the common usage of the words,which is a curse on science. 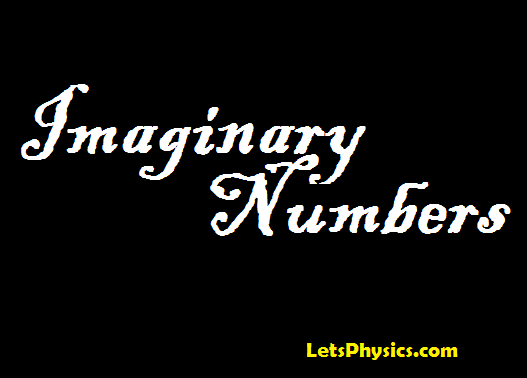 Imaginary numbers are nothing but precisely,the 2-Dimensional Numbers. For them,they're alone the numbers of a one dimension. But for us,for whom,the real numbers are the first priority,they're the members of second dimension. Humans at the beginning,failed to find numbers in the own simulation of 3D world. They started from the beginning,1 Dimensional ,which we commonly refers are the real line,real axis, x axis,the fixed axis and so on. People didn't know whether their imagination was right. They improvised the mathematics to the 2D world. They need to represent the 2 dimensional coordinate. What to do? We now use the y axis as the second dimension's number line. But how and why? Usually this doesn't maters in practical mathematics or applied fields. After all, we can't just erect a y axis,saying perpendicular to x axis and sort of. The orthogonal condition (or perpendicular condition) is just a improper idea! You can't tell how to represent a 4 or above dimensional coordinate,of exists. So simply,Imaginary number is just the second coordinate of the 2 Dimensional mathematical point. It's represented usually with i ,the square root of negative one. Well,to be two dimensional,imaginary number must be represented as a complex number, which is too, a bad name which really makes it complex. The Properties of this imaginary stuff i is quite interesting, i will say about it later.